Judy A Goddard, Artisan: Fer "Klimt"! Do you love deep, drenching, vivid color? 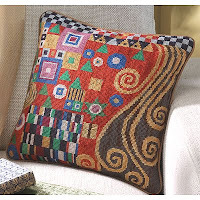 How many shades of red can be fit onto a needlepoint pillow? From a purple that is almost black to the pale, pale pink of a spring sunrise. Blue? From the light and airy shadows on the under side of puffy summer time clouds to the deep, deep blue of shadows standing out on a night of full moon magic. Yellow? How about the shimmering light of a dewdrop on a daffodil petal to the wonderful rusty orange of a robin's breast? I found this advertisement in the New York Times Sunday Magazine and was immediately engrossed. It brought back memories of needlepoint projects I have enjoyed, both those that were kits and those I was brave enough to design myself. You know, Gustav Klimt is an artist whose work I have enjoyed because of it's intricacy and his color choice. These pillows are outstanding! I may have to start saving my pennies so that I can order a couple of kits. These pillows alone have inspired me today! The colors, the forms, the detail..... now I want to paint florals, portraits, animals, cities, EVERYTHING in this style. Thank you so much for sharing these. These pillows are amazing. And I'll bet they are fun to work on because of the relatively small areas of color. No getting bored with one background color that goes on and on! I love Klimt also.